Many of the best features in AdWords are tucked away in places most people wouldn’t think to look. This includes several cool metrics which can give us more insight when we’re reporting on our performance. 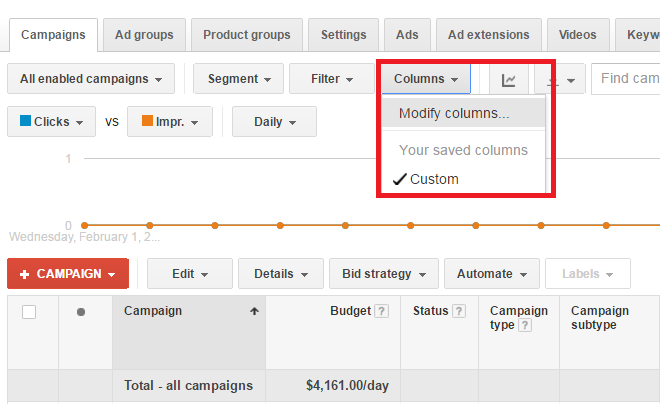 In order to change our columns, we first have to navigate to: Campaigns >> Columns >> Modify columns. One of my favorite under-utilized metrics, Search Impression Share tells us the percentage of auctions where we served an impressions versus the number of times we were eligible to serve an impression based on our current targeting. We use this as a measure of how much opportunity we are capturing. If we see that this percentage is low, we’re missing out on opportunities to show our ads and reach users. These metrics tell us why we’re not capturing those eligible impressions. Lost IS (rank) is the percentage of time where our ad was entered into the auction, but our Ad Rank was not high enough to actually serve an impression. Since our Ad Rank is our bid multiplied by our keyword’s Quality Score, if we’re seeing a high percentage of impressions lost to rank, it means we either need to bid higher or improve our Quality Score to be more competitive in those auctions. Lost IS (budget) is the percentage of the time we missed out on an impression because our campaigns exhausted our daily budget. You will only see this metric in the “Campaigns” section of AdWords since budget is a campaign-level setting. If you see a high percentage in this column, it means you need to raise your budgets. You might also want to doublecheck your search term report and look for negative keyword opportunities to keep irrelevant queries under control and preserve your budget. One of the main advantages of using an AdWords conversion tag as opposed to importing goals from Google Analytics is that we have access to View-through conversions. These are instances where an user saw an ad in a display campaign, didn’t click on our ad, but later came to us through a different channel and converted. They’re not quite as important as a conversion that came as a result of someone actively engaging with our ad via a click, but it’s nice to see which ads are influencing decisions, particularly with awareness-focused display ads. It’s because of this difference in importance that they are not included in the “Conversions” column. Conversions >> Phone Call Conv. Along the same lines as View-through conversions, the Phone Call Conversions column includes conversions outside the Conversions column. It allows us to see instances where the call came without an ad click; specifically, when a user dialed a displayed phone number manually, rather than clicking a mobile click-to-call button or calling after coming to our landing page. 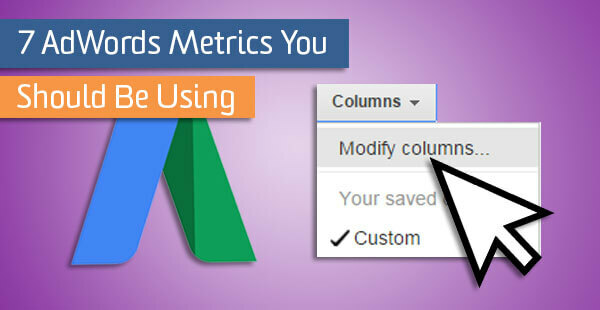 The All Conversions metric allows us to see a bit more than the regular Conversions column. Here, we get all the data in our Conversions column, plus cross-device conversions, store visits, and conversion actions not counted in the main conversion column. This one is particularly useful if you have a business that has research points on multiple devices leading up to a user converting. To get a better sense of this, there is an attribution report in the Tools section of AdWords called “Device Path,” which will give you a sense of how users move through the conversion cycle on different devices. In the instance above where we have our softer goals lumped in while looking at our All Conversions column, we can create a custom column that subtracts them out, so we hone in on the ones we care about, while still getting the cross-device attribution we use the All Conversion column for. In the example below, we are looking at our All Conversions column, but also subtracting the Email Sign-up and PDF download goals in order to hone in on conversions that lead directly to revenue. 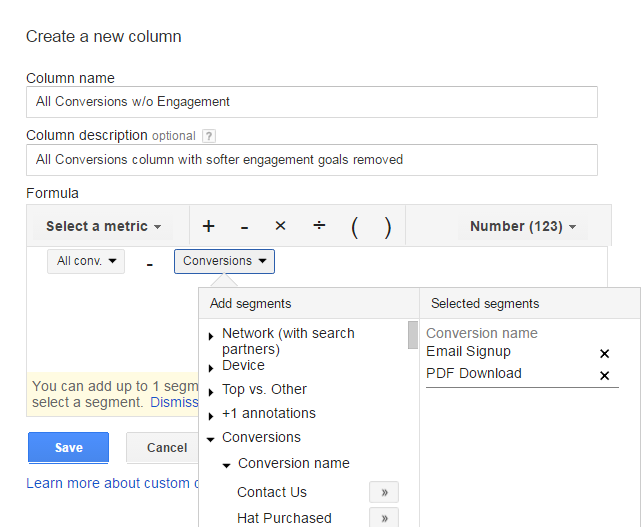 We can use custom columns to measure several different things, such as conversion rates for specific actions and return on ad spend. My next blog post will be full of custom column ideas for you to add in your account. Stay tuned!